The foundation walls are connected to the top of the footings. The purpose of a foundation is to carry the weight of the house structure down through the foundation to the footings. Whatever their construction, (concrete, brick, concrete blocks, etc. ), foundation walls crack because of lateral force, settling, heaving or uneven loads (more weight than designed on a specific section of the foundation), of the foundation walls. Natural forces such as earth quakes can also be a contributor in earthquake regions. To diagnose foundation cracks, start with a pad and pencil. 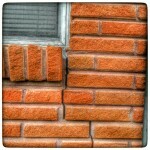 Make notes of interior & exterior cracks and their locations. When inside the lower level, you will want to try to locate them on the inside. If the crack goes entirely through the foundation it may be a red flag. Small hair-line cracks that do not go through the foundation wall are common and nothing to worry about; they may have been caused by shrinkage of the concrete or mortar joints. A found crack sometimes has a similar type crack on an opposite wall of the foundation. Similar cracks on opposite walls may have the same cause, with the exception of horizontal cracking caused by a lateral force. Vertical and 45 degree cracking is usually caused by settlement and heaving. Horizontal cracking is commonly caused by side pressure on the foundation, such as hydrostatic pressure (a lateral force). Surface cracks that do not go entirely through the wall and with no signs of displacement are not normally a structural defect. 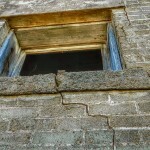 Isolated vertical cracks that do not extend to the lower edge of the foundation wall are usually shrinkage cracks. They are caused by the concrete shrinking during curing. The foundation should act as a retaining wall, resisting lateral pressure of the soil on the outside of the basement or crawl space. 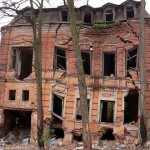 If the foundation does not provide enough lateral support, the walls will deflect inward and create horizontal cracking. Some of the causes are foundation walls that are too thin or do not have, (or not enough), reinforcement, such as rebar in the concrete foundation, backfilling the foundation too soon before the foundation has a chance to fully cure, or during back filling if big stones or hard frozen chunks of ground were dumped against the foundation. Heaving cracks in foundations made out of brick, blocks, or stones,(not concrete), will generally have cracking in the form of a step, called “step cracking”. Step cracking usually follows the mortar joints in these materials. In concrete foundations, heaving cracks are usually vertical and are wider at the top of the crack than at the base. Some areas of the country have expansive soils, which increase in size when they absorb water, causing heaving cracks. Moisture added to dry expansive soils, say from a sudden down pour, will drastically change the volume of the soil and cause serious heaving problems as well as structural damage in some cases. When the expansive soil dries, the shrinkage can also cause a pulling effect on the foundation. The method of prevention is to maintain the soil moisture content, by keeping the soil as dry as possible along the foundation. This can be achieved by proper grading around the perimeter. If a crack is active the crack may still be moving, (getting bigger, etc.) To identify an active crack, it will have sharp edges, clean inside of the crack and sometimes with bits of concrete still in the crack. Old cracks will have dust, dirt, paint and insect parts in the crack. To determine the severity of a crack or its cause, it may need to be evaluated by a geotechnical engineer. Large cracks 3/8″ wide should be carefully examined. Cracks can be measured by the engineer, to determine if it is moving or if it is stable. Many times Home Inspectors call on the services of an engineer, to be sure the foundation is sound. 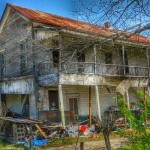 As a past Home Inspector, I have been surprised several times to find questionable cracks were sound without a concern. I was always glad it was verified for the sake of the buyer or yourself in your case. Doors and windows that are stuck and misalignment (gaps) Foundation settlement can cause doors and windows to be come misaligned. This can be seen when observing the edges around the windows or doors, where they close. Look for gaps larger on one side than the other. This can help determine where the settling is occurring. Settlement will usually cause wall cracking. Settlement cracks are wider on one end than the other. Let it be known wall cracking can also be caused by the house expanding and contracting through its seasons. If there is no evidence of foundation defects and there is wall cracking, it, more than likely, is caused by the latter. Sloping or tilting floors. I have learned during my home inspection career that most people will not notice sloping less than 1/8″ slope per foot. 3/16″slope per foot is noticeable to most people. A family living in an older home for a long time might not notice sloping even if severe. We tend to adjust to gradual sloping over time. If there is doubt, use a level to determine if the floor is level. Floor elevations should be recorded for future reference in the inspection. Unless the sloping is substantial or extensive remodeling is planned, the best repair would be to stabilize the foundation. Extensive re-leveling in an older home may cause more than expected damage to the interior walls, ceilings, doors, windows and cabinetry. If the home has been stabilized and future movement is unlikely, buyers will often accept the uneven floors. This article was written to act as tool to guide and assist a DIY Inspection on foundations. Gary wrote the BAIR (Building Analysis Inspection Report) System, which is a DIY Inspection that consists of a lot of instructional detail (a guide) written about any of the many components found in the home. The BAIR System has instruction on how to inspect a foundation and explanations on the findings; this article will help with more information, if needed. This entry was posted in Articles and tagged DIY foundation crack diagnosis. Bookmark the permalink.